NASHVILLE, Tenn. (June 22nd, 2018) – Friends of Warner Parks, a nonprofit organization dedicated to the preservation, protection and stewardship of Percy and Edwin Warner Parks which welcome more than 1,000,000 visitors each year, today hosted a reopening and ribbon-cutting ceremony for the newly-restored iconic sandstone memorial entrance. 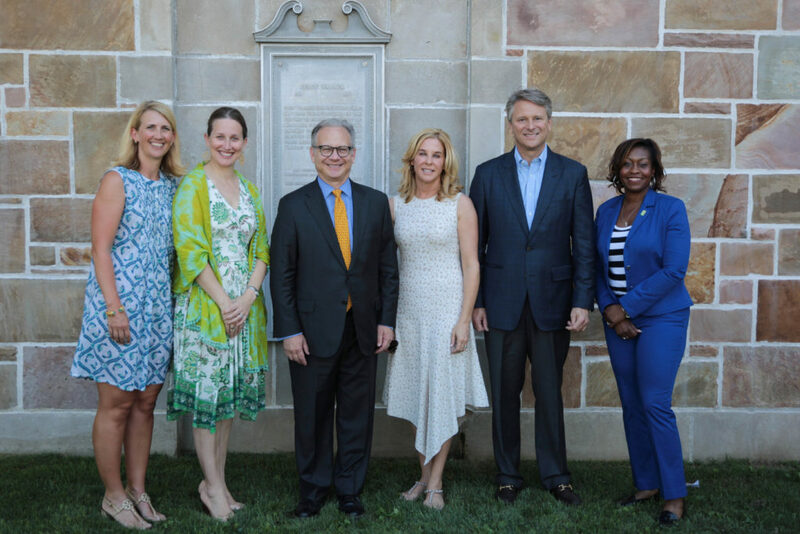 Mayor Briley and Director Odom were joined by Councilwoman Angie Henderson and Warner Parks board members Susan Weathersby and Govan White in speaking to thank the hundreds of community members who contributed to raising $190,000 for the restoration of the entrance gates found at Percy Warner Park’s Belle Meade entrance (1225 Belle Meade Boulevard). The restoration, conducted by The Tradesmen Group, Inc., included cleaning all stones using highly specialized methods, reappointing mortar joints, repairing stone fractures, replacing missing stones as well as tree work and improvements to landscaping, and lighting. The lead gift was provided by Govan White, great grandson of Percy Warner, his wife Barbara White and their children Margaret Lindsley, Govan Davidson Jr., and Richard Warner. “I’m proud to have played a part in sustaining this important piece of our shared history for the greater Nashville community for generations to come,” added White, who is managing partner and co-founder of Covenant Capital Group. The new inscription on the restored gates reads: So that future generations may continue to enjoy the beauty of wood and field and flower, this gateway to the park has been restored to its original splendor in memory of Percy Warner. The gates were originally dedicated in 1932 by the grandchildren of Percy Warner, the restoration’s ribbon cutting ceremony serves as a reminder of the importance of protecting and preserving the Tri-Star state’s long-standing history, and those who have helped shape it along the way. Friends of Warner Parks is dedicated to the preservation, protection, and stewardship of Percy and Edwin Warner Parks. It works to protect the natural and historical integrity of the area by supporting appropriate recreational activities, maintaining and enhancing its features, and promoting programs that inspire appreciation and conservation of the Parks. Friends of Warner Parks works closely with Metro Nashville Parks and Recreation to leverage volunteer, partnership and philanthropic efforts to care for the Parks. Among other projects, funds raised by Friends of Warner Parks are used to fund programs and staff at the Warner Park Nature Center, restore historic structures, and maintain trails and other park amenities. Friends is a 501(c)3 organization. Learn more. It is the mission of the Metro Parks and Recreation Department to equitably provide everyone in Nashville with an inviting and sustainable network of parks and greenways that offer health, wellness and quality of life through recreation, conservation and community. The department oversees nearly 16,000 acres of open space, including 185 parks and 86 miles of greenway.